(New Britain, Conn., Feb. 6, 2018) – The New Britain Bees today announced that outfielder Ryan Kalish is the first player signing of the 2018 season. 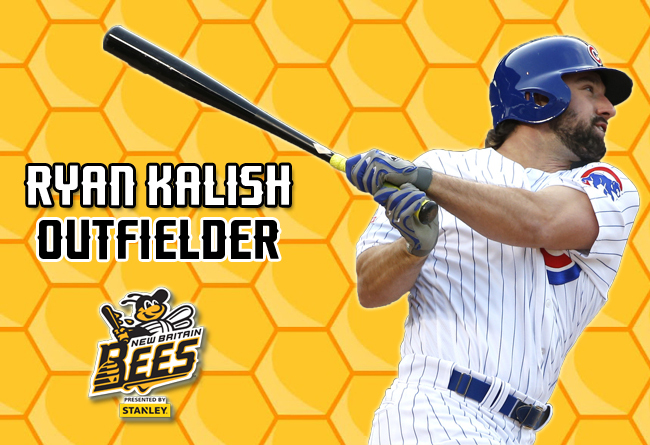 Kalish joins the Bees for his Atlantic League debut and 10th season of professional baseball. The former big leaguer last played in 2016 with the Chicago Cubs organization. He began the year with Triple-A Iowa of the Pacific Coast League, batting .368 in 21 games, which earned him a call-up to the Major League roster. The slugger appeared in seven games with the eventual World Series Champion Cubs before an injury ended his campaign. The 29-year-old began his professional career with the Boston Red Sox after being selected in the ninth round of the 2006 amateur draft. He rose quickly through the Red Sox farm system, making his Major League debut in 2010. Ryan would again make an appearance in the big leagues with Boston in 2012, before joining the Cubs organization. In 153 career Major League games, he owns a .245 batting average with 27 extra-base hits, 36 RBI, 52 runs scored and 16 stolen bases. Over the course of 532 career minor league games, Kalish has comprised a .278 batting average with 53 home runs, 256 RBI, 320 runs scored, 112 stolen bases, and a .363 on-base percentage.